The wireless telecommunications company in the United States, Alltel has recently unveiled a new phone called as LG Banter. The slider phone is equipped with similar features as the recently announced LG Rumor 2 phone by Sprint but slightly different in design. 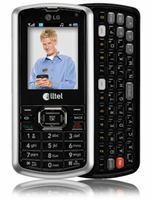 The messaging functionality has been enhanced with a full QWERTY keyboard and preloaded with Alltel email, Yahoo! and AOL IM services. Sports a 2-inch QVGA display screen with 240 x 320 pixels, LG Banter is also featured with a 1.3-megapixel camera. It supports memory expansion of up to 16GB, offers a talk time of up to 5.5 hours and stand by time of up to 12 days. In addition, it is Bluetooth enabled, Web enabled and, interchangeable face and black plates. The Alltel LG Banter is available at Alltel retail stores for $19.99 after a $50 mail-in rebate and a two year service agreement.